The biggest challenge for most of us in our lives, especially for Startup Entrepreneurs is to learn from our past. We have all heard that it is perfectly fine for us to make mistakes. In fact, in my formative years as a Retail Professional when I worked at Pantaloon Retail (now The Future Group), there used to be posters in our office that it was “Ok” to make mistakes as long as you don’t repeat them and of course, one learns from them. Indeed I have made a number of mistakes in my Retail Career spanning 20 years but my specialty has been that I have gotten up back every single time after faltering with some amazing learning. And that’s what this article is all about. It’s been in my mind to set-up my own Retail venture as an option for Entrepreneurship for some time now. From Education to Food to Tech to Product Retail, we (my wife & I) dabbled for a long time on which segment to choose. My only criteria, having signed up 140 cafes for Café Coffee Day and 160 Dealership Outlets for Royal Enfield (both of them all India) – I was General Manager – Business Development at both companies - was that the business I was about to build should be Scalable, Saleable and Profitable. Among many other options that we finalized was the one retailing baby products – which is perhaps the only category other than food that has a potential sale 365 days a year and is almost price inelastic so to say. And that’s how my first startup venture Smiling Baby was conceptualized way back in 2013. While the business model was completely fool proof and continues to remain so even after 4 years, there have a few shortcomings as well. I took each of those lessons with grace and have become a much better Entrepreneur over the past 36 months. Now as we enter in to our second phase, Smiling Baby 2.0 as I call, there a few learning that I have already implemented. I spoke about these initiatives at the recently held ReTechCon2017 at Mumbai, organized by Retailers Association of India, the industry body that represents Retailers of all sizes. Among other things, the first thing that we have implemented is a truly “omni-channel” retail model. We already have one store in Chennai and are setting up two more in Coimbatore shortly. All the existing and future stores are connected together on the backend with the Retail store and a website (+ Apps) in the front-end. When a customer visits a store and looks for a product which may not be physically at the store but is still available on the website/app, she will still be able to order the item and it gets picked up and delivered to her from some other store where they may have it in stock. And all this within less than 24 hours from the time of ordering! E-Commerce, as a habit for shopping is getting better by the day in India and that’s been my biggest learning in my journey. That Amazon has purchased Whole Foods strengthens my model of Omni-channel because that’s precisely what Retail in the 21st century is going to be. Customers need a product right there when they need it. While the e-commerce warehouses will continue to remain, it is all about effectively utilizing the retail store fronts which we have all built. The power of leverage is immense and we at Smiling Baby would stand testimony for the same. Watch this space. Chennai’s T. Nagar, which is world-famous for its shopping hub has been in the news for a wrong reason since the past few days. 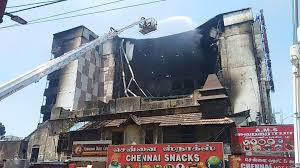 One of the largest Retailers from Tamil Nadu, The Chennai Silks’ retail showroom had a minor fire on the wee hours of Thursday, 31st May 2017. And gradually the fire spread all through the building eventually burning the entire building down. The building constructed over seven floors had a floor-plan violation and a case is pending in the Indian Courts for a long time now to decide whether their violation was acceptable or otherwise. The Ministers, Corporation Officials and others in the Government who were hand in glove all this while have distanced themselves suddenly and alleging that the Retailer did not take adequate measures which led to this tragic incident. Fortunately, and as per media reports, no one was injured nor any casualty was reported in this tragedy since the fire was first observed at 4.30am and apparently the Fire Tenders reached by 6am. It had taken about a day and half and over 100,000 litres of water to douse the fire completely. As I write this column, the Government has decided to demolish the building as a safety measure for the entire area – including residences on the rear side as well as the hundreds of shops around this structure. This was a nightmare that I have envisaged over the past 20 years of my active life in Indian Retail and this sad event actually occurred which I am unable to come to terms with. 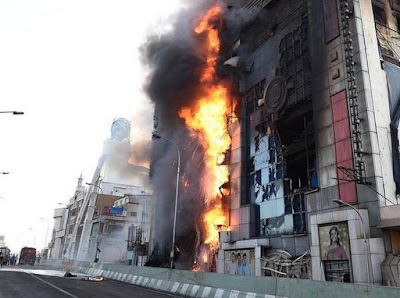 The callousness of business houses as well as the attitude and apathy of the officials in allowing such illegal structures without adequate safety norms, especially fire safety, is to be abhorred. How on earth can a seven storeyed structure come on up a narrow 50 feet road and which has a flyover right opposite it’s fascade? No wonder the Fire tenders were unable to do much due to lack of space for this purpose which is one of the prerequisites of seeking approvals while constructing such a large structure. And a minor fire couldn’t be doused by the 14 staff who were in the shop at the time it occurred goes to show how much importance some of us Retailers give to fire-safety norms. It is being widely discussed on social media through messages on Whatsapp that the Retailer paid Salaries exactly on 1st June to its employees and also creditors were paid their dues. As a retail chain of 50 years with 17 stores across 14 cities, I would expect them to have these simple systems and processes in place. While I respect the fact that the Retailer went about disposing it’s duties, how would the Retailer compensate the loss and livelihood of thousands of people involved in their businesses who have their outlets in and around the building where tragedy stuck? The Secretary of the Association of Shops in T. Nagar pegs the loss at Rs. 50 Crores per day. While the Retailer itself would have insured for the stocks, property and losses, who will compensate the losses of others who have been disturbed by this incident? To give you a perspective, the Sales turnover in and around Usman Road, T. Nagar is pegged at about Rs. 18,000 crores pa. Yes, you read that right. It’s not just the sheer volume of sales that occur here but the livelihood of the people who are part of the ecosystem here. Will the Courts take a cognizable view in this front and punish those guilty and set an example? Time will tell.